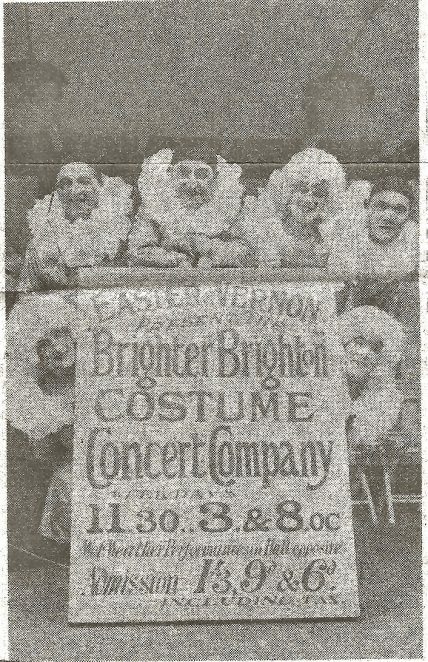 I have attached an article taken from the Brighton and Hove Gazette which refers to “Easter Vernon Brighter Brighton Costume Company”. 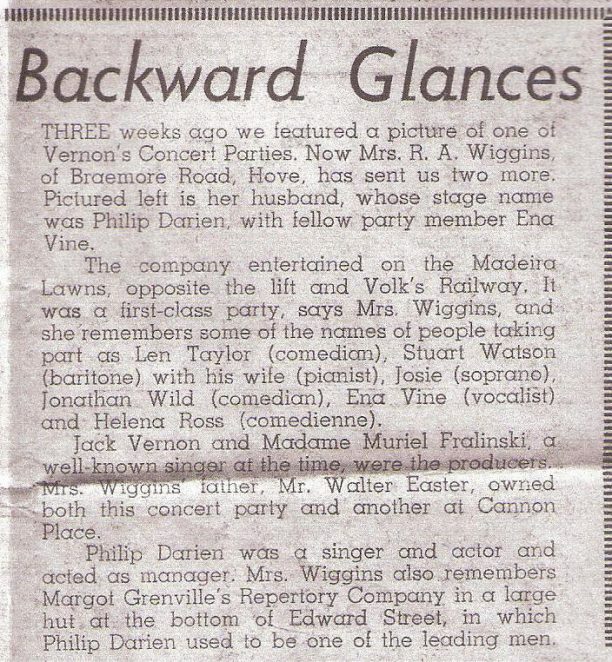 My relative is featured in the photo whose stage name is Philip Darien; his real surname was Wiggins. I am trying to find the original photographs so good resolution copies can be made. Also any information on this entertainment group would be appreciated. This may be a tentative lead but…Brighton History Centre holds in its collections a set of illustrated magazines from the early 1920s titled ‘Brighter Brighton’. I have used them a great deal for background detail for my thesis on interwar suburban Brighton. They are a curious mix of articles…think ‘Hello Magazine’ linked with ‘The Economist’! 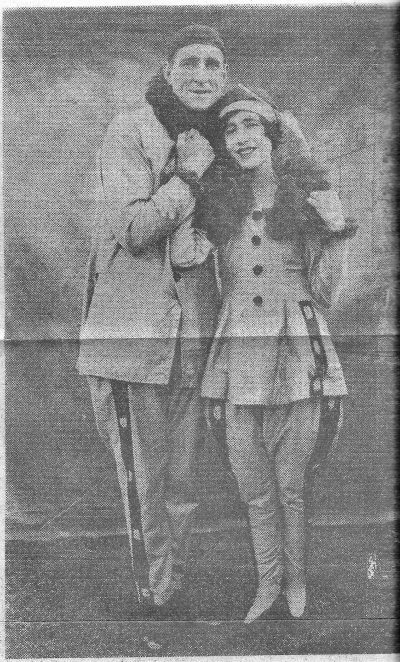 Sorry, can’t help re Philip Darien, but my grandmother, whose stage name was Nellie Banks, was a singer, dancer and comedienne and a member of Easter & Vernon’s Brighter Brighton Concert Party, and of various other seaside entertainment troupes on the South Coast, during the 1920s and early 30s. I have a number of professional postcard pictures of Easter & Vernon’s Brighter Brighton Concert Party dated 1924 which I’ve been intending to use to create a page on MyB&H for ages, just never found the time yet. These feature, inter alia, my grandmother and another lead called Syd Leslie, and also make mention of one Uncle Harry who may have been the photographer. There appear to have been multiple Brighter Brighton troupes, and I guess my grandmother’s was a different one to the Costume Concert Company illustrated above – certainly, she isn’t the lady in the above photo. Sadly, she’s no longer with us to ask. This has given me an incentive to get the promised page created, which I’ll do as soon as I can – watch this space! Hi, Walter Easter was my Great Grandfather and look forward to seeing your pictures. Rosa Wiggins was my Dad’s aunt. I have read with great interest and appreciation, the above comments. My paternal grandmother was Maud Evelyn Wiggins who was born and raised in Hammersmith. Her father, James Wiggins, was in a partnership in owning a plumbing company in the mid 1800s. I believe Phyllis Sone, who recently died in Devon, was married to Philip Darien (Harry Wiggins). I would love to hear from Bev Doo, Geoffrey Mead and Len Leichti to explore the Easter Vernon part of the family history further. I’m returning to Brighton from Canada in September 2014 so will have to visit Brighton History Centre. Please send an e mail to the address above. Thanks. I need to correct my earlier comment regarding Phyllis Sone. She wasn’t married to Harry Wiggins. She was in fact his daughter. Thanks. re Brighton History Centre. Is there a contact e-mail or address or website? Does the Centre have any publications mentioning notable people involved in business in Brighton or mentioning local businesses such as tea rooms?